A fruit infused water bottle is one of the easiest ways to drink more water. They’re portable, durable, and help make ordinary water taste great. 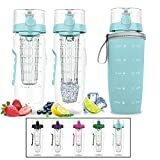 There are a number of fruit infused water bottles and pitchers available that help make creating an infused water recipe easier. These water bottle infusers and pitchers are dishwasher safe and make a nice table-ready pitcher for serving your flavored waters. We’ve checked out the top selling fruit infused water bottles available on the market, and here are our thoughts on these products. We’ve provided a list of our Recommended Fruit Infused Water Bottles and the Top 10 Fruit Infused Water Bottles. 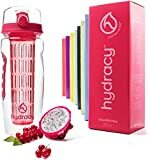 This tough little fruit infused water bottle is great for taking to the gym, office, school, travel, the outdoors — just about anywhere you go every day. It’s made of impact resistant plastic so it won’t break if it’s dropped and can handle very hot and cold temperatures. It comes in many colors including red, yellow, green, blue, and yellow. The stylish design and portability of the Asobu Tritan Flavor it Water Bottle makes this one of our favorite picks. 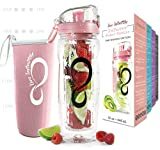 This fruit infused water bottle is great for travel, which makes drinking more water on the go easier. It’s made of heavy duty plastic, a material that’s touted as safer for food contact. It’s easy to clean, and holds a decent amount of water. It has a rubber bottom which makes it easier to keep on top of smooth surfaces, like your desk at work or a table at a restaurant. We really like the chemical-safe material this bottle is made of, because if you leave it in the car and it gets hot (which happens a lot), you don’t want to be worried that the plastic has leeched bad things into your water. 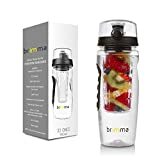 This Brimma Leak Proof Fruit Infuser Water Bottle, Large 32 Oz. guarantees it. This larger-sized pitcher is our favorite for one primary reason: it’s BIG! If you’re going to go through the effort of making a batch of fruit infused water, you want to get a lot out of it, right? It’s also handy to be able to take this attractive acrylic pitcher from the refrigerator and put it right on the kitchen table. 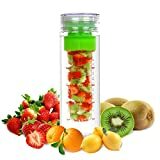 What is the best fruit to use in a infuser water pitcher? Any fruit will work as long as you can cut it into small enough pieces to fit in the infusion chamber. Try any of our infused water recipes in a fruit infused water bottle or pitcher and you’ll understand why these are so popular. 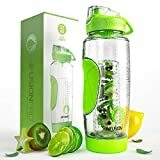 What is the best fruit infused water bottle? All in all, we found every one of these fruit infused water bottle choices worked fine. Your decision would depend primary what was most important to you: Size, portability, or style. As long as whatever you choose helps you drink more water, you can’t lose with any of these great products. Live in the UK? 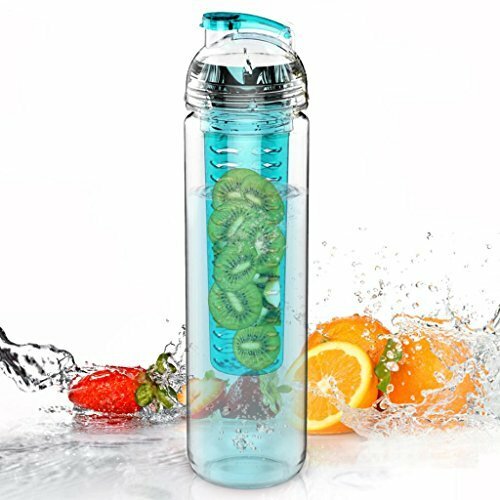 Check out our UK Fruit Infused Water Bottle Reviews.